This week’s Project Pastry Queen challenge was selected by Sarah of 20 Something Cupcakes: Espresso Creme Brulee. With a broken oven and no one else in the house on-board with a coffee-flavored dessert, I was going to take a pass. But then my oven came in a week early. So we celebrated. With Grapefruit Creme Brulee. Creme Brulee is not hard to make. Not at all. And Sarah can prove it – she has a video posted to go along with the recipe. I scaled the recipe down by 2/3 to accommodate a generous 2-serving dessert, and then adjusted some of the odd-ball measurements. Like 2.33333 egg yolks. Because that was just not going to happen. I infused the custard with citrus flavor by heating grapefruit zest with the cream and letting the mixture rest. And then I rubbed a little grapefruit zest with granulated sugar and used that for the bruleed topping. The resulting creme brulee has pronounced citrus and grapefruit notes without the overwhelming bitterness of the fresh fruit. Although, I happen to adore fresh grapefruit. 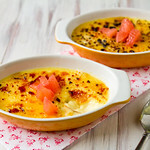 Creme brulee infused with grapefruit. Use your favorite variety of grapefruit. If you are so lucky to have Texas grapefruit in your produce department, grab one! Reserve a pinch of grapefruit zest (~1/2-1 tsp), and put the rest in a small sauce pan along with the cream and sugar. Heat until very hot and steaming (but not boiling). Remove from heat and let rest while oven is preheating to 300. Reheat the cream mixture until very hot (again, don't boil). Strain 1/4 cup of the cream mixture into the egg yolks, while whisking (this will temper the eggs and prevent scrambled eggs). Strain the rest of the cream mixture into the yolk mixture and whisk thoroughly. Divide custard between two 6 oz baking dishes and place in larger pan. Carefully pour very hot water into the pan, taking care not to splash water into the custard, until it comes halfway up the creme brulee dishes. Transfer to the oven and bake ~35 minutes, until set - the center should jiggle but not be fluid. Remove baking dishes from the water bath and let cool for 20 minutes, before transferring to the fridge uncovered to chill thoroughly. Massage the reserved grapefruit zest with the remaining 4 tsp sugar. Evenly sprinkle over the baking dishes and broil for 1-2 minutes, until the sugar has melted and caramelized (a kitchen torch can accomplish the same task). Serve garnished with chopped grapefruit segments, if desired. That looks really good! 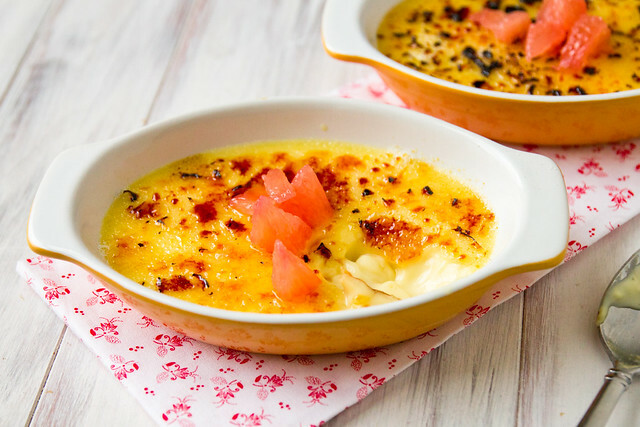 I’ve never tried making creme brulee before, I’ll have to give this recipe a try soon! Oh, yeah. My husband is actually the creme brulee maker in our house. I seem to fail at it every time. I made the mistake of calculating the nutrition info once before too! Now it makes it so much harder to enjoy – but I DO love it – especially the good ol’ traditional kind! Mmm this sounds so yummy! I made a half recipe and, I agree, I could barely eat half of a ramekin for it being so rich. Even with just a half recipe, I’ll be eating cream brulee for the rest of the week! I’m so pleased to realize exactly how easy creme brulee is now! I’m relieved you didn’t put espresso and grapefruit together in creme brulee – though I’m sure weirder things have been done! Lovely pics, as always. Gorgeous pictures! I do like creme brulee but I’m not sure I’ve ever had a citrus flavoured one. It sounds really delicious. I love this grapefruit version! I bet it was a delicious balance in flavors. So pretty to look at! Sounds so refreshing. Good to know the grapefruit zest didn’t curdle the cream. Def going on my list of to-do’s! oooooh, i love this twist on the classic favorite! so beautiful, too! I firmly believe I will never look up the nutritional facts about creme brulee. It’s too delicious to feel guilty about eating. This looks divine! 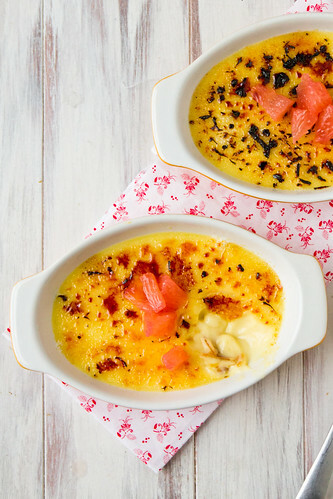 Espresso creme brulee sounds divine…but grapefruit creme brulee sounds WAY better! You know what also might be nice? Meyer lemon creme brulee. SO on it. Yay for getting your new oven! I’m doing jumping jacks for you! I’ve never eaten or made creme brulee before but I definitely need to try, and this looks so good. I love grapefruit. Yummm! Mmmm. I like the sounds of this much better than the espresso option! (Coffee products and I don’t get along too well). I bet that the astringency of the grapefruit against the creaminess of the custard was awesome! i love, love grapefruit and creme brulee. this looks like a total winner in my books. I love grapefruit. I cannot wait to try this. How large are your serving dishes? They look like Le Creuset? Just over 6oz, got them from Garden Ridge. I love creme brulee. My favorite part is playing with the little torch to brown the sugar! I’ve got to try the Grapefruit version now. Thank you!